Lice, and the disease related to them, are one of the biggest obstacles that the salmon farming industry is facing at present. Salmon lice are crustacean parasites that attach to the skin of salmon, causing lesions that can reduce health, growth and survival. Sea lice infestation can also compromise ﬁsh welfare and its treatment costs the salmon industry in the region of €300m every year and £30m every year in the UK alone.This phenomenon is fast becoming the primary threat to salmon farming, at a time when demand for salmon is increasing – from one million tonnes in 2002 to over two million tonnes in 2012. ‘Cleaner-ﬁsh’, predominantly Lumpﬁsh, are being used in research projects to combat this and promote sustainable ﬁsh breeding, rearing and supply. The commercial use of cleaner-ﬁsh as a means of sea lice control has gathered signiﬁcant momentum over the last few years. Like wrasse, lumpsuckers can cohabit with salmon and feed on sea lice, and they have been identiﬁed as a complementary species to wrasse in boosting the supply of cleaner-ﬁsh to the industry. In order to meet the demand for both research projects and future breeding/rearing requirements, Purewell have developed a range of lumpﬁsh tanks which will meet those demands and provide research facilities with the high quality equipment to conduct tests, and lumpﬁsh production organisations with robust, purposeful tanks built to withstand the rigours of such an environment. upon end-user requirements. These centre-pieces have been designed with a variety of research projects and commercial uses in mind; in essence, a cone-shaped centre-piece, or a barrel-style arrangement, designed for larger stock or working with higher ﬂow-rates. Let’s start with technical stuff…. these are circular tanks with an internal diameter of 1.85m, and a 50mm external ﬂange, an internal depth of 940mm, sitting on a skirt of 180mm, giving an overall working height of 1.12m. So, without resorting to a calculator, this provides a maximum cubic capacity of 2.53 m3, or operating with a 100mm freeboard, 2.26m3. In the centre, a ‘hanging plate’ arrangement provides 2.2m2 of extra surface area, bringing the total vertical surface area of the tank to 5.4m2. The design of this central arrangement gives excellent through ﬂow of water, and ultimately over the lumpsucker, both either side of the plates below the framework, maximising the growth and cleaning aspects of the ﬁsh. The plates are easily removable for cleaning and maintenance, and with four plates supplied with each tank, the options for up-scaling capacity is catered for from the outset. This phase of the development of the new range of products will assist Purewell’s client in the fast-paced research and trials of lumpﬁsh which form part of the treatment of sea-lice, which so affects the Scottish salmon industry. In the initial trials of the 1m ‘cone’ tanks, one of Purewell’s clients have been so impressed with it’s attributes, giving unprecedented lumpﬁsh growth, they have planned to expand the operation almost immediately. Another exciting aspect of Purewell’s research and trials on this new tank is that the central hanging plate arrangement can be ‘retro-ﬁtted’ to existing tanks; a small converter piece in the base/ sump area of a tank will allow the ﬁtting of the hanging plate arrangement, thereby giving farm operators the ﬂexibility to move from one species to another or adapt redundant tanks, brood stock tanks, or existing lumpﬁsh tanks to give a greater surface area. 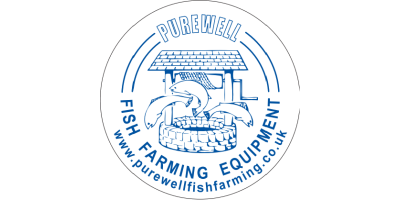 No reviews were found for Purewell - Lumpfish Tanks. Be the first to review!